The drama starred Jim Pyke as Les, Terence Maynard as Ben, Nicola Arumugam as Hashi, Ram John Holder as Ben’s grandad, and Sudha Bhuchar as Aunt Minah. Photo includes: John Greening – director, Kevin Lakin – location manager, Peter Lloyd – script editor, Amanda Neal – 1st AD, Barbara Mackie – Producer, Midge Ferguson – AD, Janice Rider – Costume Designer, Bev Dartnall – Associate Producer, Leigh Ashurst – design, Jim Gray – camera, Andy Morton – sound, Jo Mainwaring – PA, Vivienne Oldham – make-up designer. Dave Bushell, was the lighting director, although I can’t see him pictured. 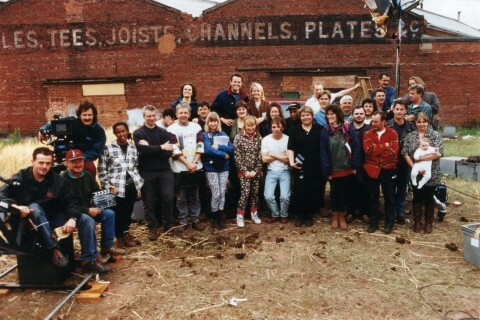 My first ever drama job; oh, how things have moved on!! This was the first drama i edited on an early AVID. I have a copy on Beta sp in my loft! It was particular for the cgi blue screen field of wheat created by graphics, and the music which enhanced the quirky nature of the storyline.